Another beautiful design I offered for my May 1st, and May 5th, 2018 Creative Therapy classes. 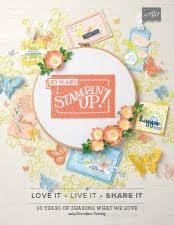 I used Remarkable You, and should you want to order this retiring set, or any of the supplies I used to make this all occasion card, please just click Right Here to place your order in my on-line store before May 31, 2018. The base is an 8 1/2 x 5 1/2 piece of Pear Pizzazz scored at 4 1/4. Also, the smaller piece is 4 x 3. The Daffodil Delight layer is 5 1/4 x 4. 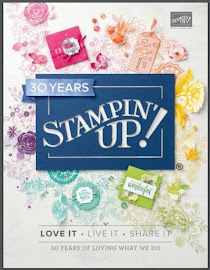 The Whisper White layer is 5 x 3 3/4, and embossed with the Softly Falling Embossing Folder. The smaller piece of Whisper White is 3 7/8 x 2 7/8. The words (from Thoughts & Prayers) and the flowers are stamped with Tuxedo Memento Black ink. The flowers are colored with a blender pen and Daffodil Delight and Pear Pizzazz ink pads. The 3/8" Pear Pizzazz Shimmer Ribbon is for beautiful accent.